The Rib-O-Lator is the hottest new BBQ and rotisserie accessory on the market today. 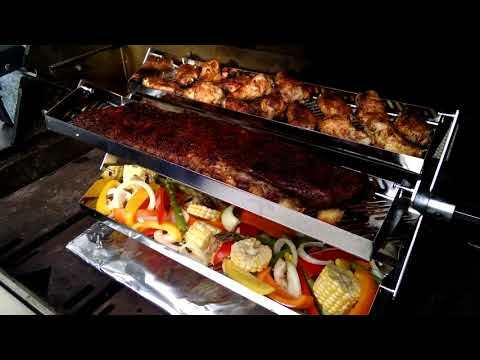 Its exclusive tray design means you can now rotisserie any kind of food ribs, seafood, steaks, burgers, hot dogs, etc. Always tender and juicy! The Rib-O-Lator uses a revolutionary indirect-heat cooking technology that ensures that you will be the Master of the grill all summer long! The Rib-O-Lator Rotisserie accessory will fit on 99 percent of the grills on the market; However it may not fit some of the smaller inexpensive grills. You will need 5 1/2-6 inches from the center of the rotisserie rod down to the burner, without hitting any part of the grill. It will fit rotisserie rods from 5/8 to 5/16. On some grills, you may need to remove the heat shield covering the burners. The Rib-O-Lator trays measure 5 inches x 17 inches x 4 trays which equals a total of 340 sq inches of cooking surface. The stainless steel rib trays are dishwasher safe. The spit rod and motor are not included with the Rib-o-lator. I bought these a few years ago and I notice the reviews were older anyway so I thought it would be interesting to write one from someone who's owned them for over 5 years. They're a quality product and, after these years look just like they did when I first got them. Secondly, I like to cheat on ribs and put them in the oven for a while then on the grill for smoking. This is just perfect for that because you can set the fire low and let them rotate in the smoke and not worry about them at all. If you want to add some vegetables or a few potatoes, you can do that too. I received this for X-Mas last year and couldn't be happier with it. The quality and construction is super, what it allows you to cook to perfection is simply fantastic. I just ordered 5 for gifts to those who think they have Everything....You will not be disappointed if you like to grill or smoke food. this is the bomb...Only thing you have to pay attention to is centering your meat. Do that and the rest is simply and the clean up is amazing. Hot water and soap and back to brand new. I forgot them in the grill as I had a business trip and it was two weeks before I remembered the Rib-O-Later was still in the grill. Honestly I just knew it would be rusty or at the very least very hard to clean. To my AMAZEMENT, it was easy to clean and NO spots of rust or discoloring on the stainless.....That is evidence of quality stainless and you can't fake that. The quality of this unit is very good. You do need to be aware that centering the weight on the racks is important, but other than that, the Rib-O-Later "ROL" is the BOMB. It makes cooking chops, chicken super easy to get fantastic results and produce juicy evenly done meat. Now the surprise, I slow smoked some chicken breasts and forgot to clean the ROL as I went out of town on business. Two weeks later I remembered what I'd done. When I removed the ROL and cleaned it, there was no sign of rust or any other discoloration of any kind. Hot water and mild soap and it was like BRAND NEW. In this day and age, it is really nice to find a company that actually does what it says. This unit is made of quality Stainless. If you like smoking and grilling, and if your grill will hold this unit, you will be one happy camper owning one. Have used this rotisserie twice,once with country ribs and once with chicken wings. The food turned out great. Balancing the food on the trays and holding on to them while basting food is very important. During the learning curve I did tip over a few trays. Have a BBQ glove handy to hold trays when loading & unloading food. I don't plan on cooking on this unit too often, but it is a fun BBQ toy to have for parties and occasional cooks. Can you use it over wood or charcoal? Hi, Bob. As long as your wood or charcoal grill has the clearances and spit rod size listed in the Key Features, the Rib-O-Lator can be used. Hi, Robert. This should work with Weber Summit grills. Does the Rib-O-Lator fit the Weber Summit 600 grill? Hey there! It will work with the Weber Summit 600. All you need to make this work is 5 1/2 - 6 inches from the center of the rotisserie rod down to the burner, without hitting any part of the grill and a rotisserie rod sized between 5/8 to 5/16 inches. What grade Stainless steel is the product? Thanks. Hey there! The Rib-O-Lator is made of 304 grade, durable, rust resistant stainless steel. Can you tell me the full dimensions of this product? what is the max width and height between the two trays? Are you able to close the grid lid with this product when grilling? Thank you for contacting us. The Rib-O-Lator trays measure 5 inches x 18 inches x 4 trays which equals a total of 335 sq inches of cooking surface. You will need 5 1/2-6 inches from the center of the rotisserie rod down to the burner, without hitting any part of the grill. It will fit rotisserie rods from 5/8" to 5/16". Let us know if we can help you with anything else. Hey, Mike! The 4 trays are 5 X 17 inches for a total of 340 sq. inches of cooking space. The trays are approximately 3 inches apart in height and you can absolutely close the grill while using this product. Hey Arthur! Unfortunately, this won't work with the Big Joe Joetisserie.